I consider myself extremely fortunate that LBL is not an issue that affects me, however, I have a very good friend who has mentioned the subject more than once. After a variety of health issues and giving birthing two children, is it any wonder that her pelvic muscles may not perform as well as they used to? Which is why I'm taking this opportunity to introduce her (and you) to SAM and the super sleek new Poise Microliner. Why wouldn't I want that for one of my oldest and closest friends? During more than one night out involving the laughter of a great card game or the telling of a very funny story, she has managed to stutter out, "I'm peeing!" and jumped up to run to the bathroom. And, while participating together in at least one active event (e.g. aerobics class or going for a run), my mumbles of "I'm exhausted!" have been met with "I pee a little bit every time I jump, so...?" Poise sent over a perfect collection of items to put LBL to rest and I can't wait to pass these along so that my amazing friend can put them to use. No matter if she is doing yoga, taking a walk with her family or getting ready for a night out with yours truly, she won't have to worry. SAM and the new Poise Microliner will absorb wetness, neutralize odor, and stay drier from start to finish! This seems like a good product, but I have to say that their TV commercials are pretty awful. Like, changing the channel awful. I might still get the sample, though; the product will be around longer than their ad campaign, I'm sure. they seem like they will work well. i will definitely get the free sample and see how they work. I am not affected by LBL either and I have heard that pregnancy can wreak havoc on the bladder. 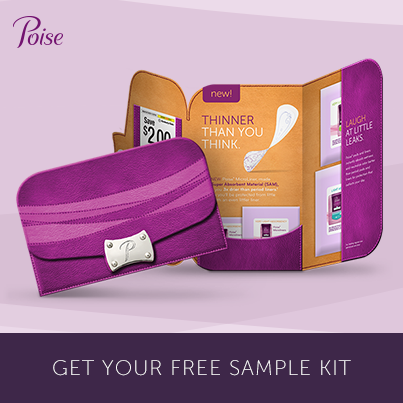 I have heard great things about Poise though, thank you for sharing this great review.